With its high density, tungsten alloy is the ideal metal for military defense. Tungsten is non-toxic, and environmentally friendly materia. 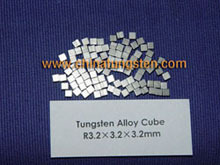 Tungsten alloy cubes for military defense can easily replace lead in most cases. Having more concentrated weight means having more control to achieve the center of mass that you are targeting. Owing to its great hardness and resistance to high temperature, tungsten has been increasingly adopted in military defense increasingly today. 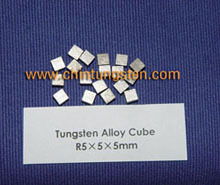 We can offer tungsten alloy cubes for military defense in various sizes. 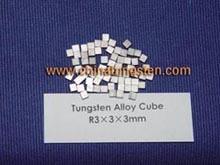 We offer the tungsten cubes, rod, ball, cylinder, block, etc. for military usage, such as bombs, armor-piercing bullet, etc. We welcome the opportunity to cooperate with our customers in the design of individual specifications. Our mission is to meet individual customer requirements. Flexibility is our strength and we pride ourselves on being able to find the right solution for every customer. If you have any interest in the tungsten alloy cubes for military applications, please feel free to contact us by email: sales@chinatungsten.com or call: 86 592 5129696.